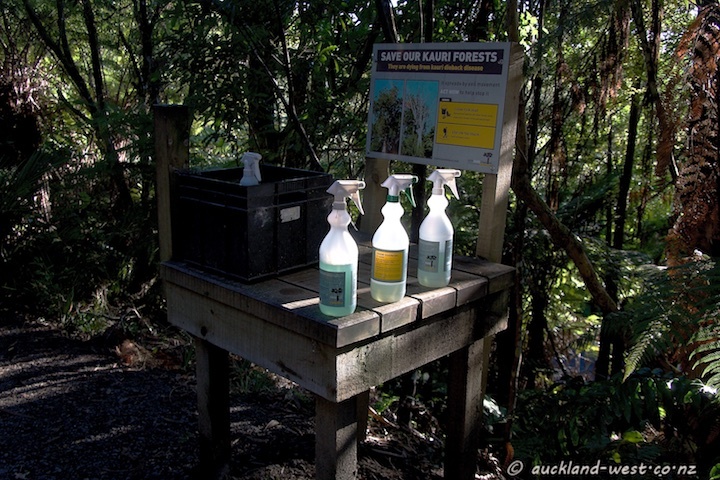 Spray bottles of trigene await the visitor to a bush walk in the Waitakeres (and some paths are closed to prevent contamination). In combination with brushes (not visible in the picture) this is a measure to prevent the spread of the Kauri dieback disease, a soil borne disease (Phytophthora taxon Agathis, PTA) which is seriously threatening our remaining stands of kauri, an iconic native tree (agathis australis). Read more about kauri dieback here and here.